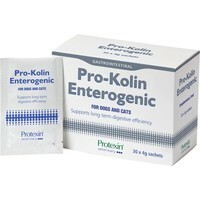 Protexin Prokolin Enterogenic Powder acts to reinforce the gut barrier, improve/assist the gut immune system and normalise the balance of the good and bad bacteria in the gut (known as the microflora). This helps to effectively manage long term gastrointestinal conditions, so that your pet can enjoy a happy, healthy life. * Repairing damaged intestinal tissue. * Providing and supporting the beneficial bacteria needed to restore gut health. 35kg or more :3 sachets. My vet recommended this product for our Lhasa Apso age 17 years, he has bowel problems and this product has made a huge difference to him, we have used it daily for at least two years now. This product has made all the difference to my dogs, one with Inflammatory Bowel Disease thrived on this and it eradicated her problems. I can't recommend this highly enough. My dog has always had a very sensitive stomach and was very skinny as a result of having a consant runny tummy. I tried endless types of food but it would work for a while but then the runny tummy would start again. He has been on these powders for a year and i now have to keep an eye on his weight as he is almost overweight. Fantastic product.